In 2006, in the middle of one the hottest years on record for Canadian housing, then Bank of Canada Governor David Dodge sent a testy letter to his counterpart at the country’s mortgage insurer warning about lax standards fueling demand for homes. Today, Dodge has new words of caution: worry more about supply. “It’s not very complicated: there’s a supply curve, there’s a demand curve. If you restrict that supply curve then don’t be surprised by high prices,” said Dodge, who over four decades as a public servant worked at the Canada Mortgage and Housing Corp. and headed both Canada’s finance department and its central bank. While Finance Minister Bill Morneau’s recent measures to cool Canadian housing markets are only the latest in a decade-long effort to stem demand, beginning with Dodge’s letter, they have also begun to reveal something else: the federal government’s waning ability to solve the problem. 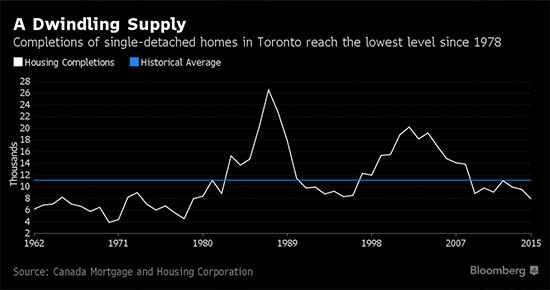 The two hottest markets at the center of concern, Toronto and Vancouver, are increasingly driven by supply constraints that federal officials can do little about. 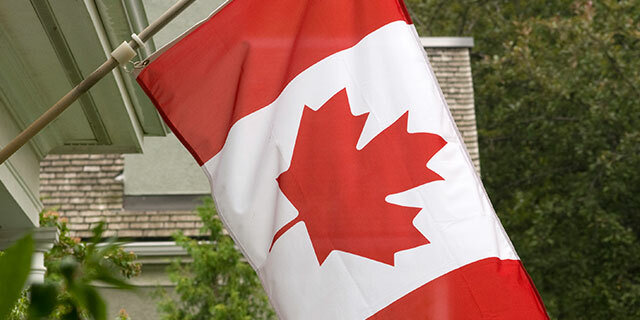 Blanket nationwide efforts to curtail demand meanwhile threaten to slow already weak markets in other parts of Canada. The bigger culprit may be local politicians’ reluctance to foster housing development, Dodge said, not availability of mortgage insurance. The most recent measures -- a combination of tougher qualification rules for home buyers and proposed loss-sharing with banks -- were announced early last month, and the first bits of housing data show no evidence of an immediate impact, particularly in Toronto. Benchmark housing prices -- calculated by the Canadian Real Estate Association -- were up 2 percent in October in Canada’s biggest city and have gained 18 percent over the past 12 months. In Vancouver, where prices did decline in October, prices are still up 28 percent over the past year. That contrasts dramatically with markets in most cities outside of lower British Columbia and the “Golden Horseshoe” around Toronto, where prices have been flat or negative. This helps explain the cool reception Morneau has received. The big banks, who largely endorsed the last major move in 2012, expressed concern this time. Just about everyone in the industry -- from brokers to builders -- are pleading for policy makers to turn their attention to supply instead of demand. While Morneau says he was compelled to act for financial stability reasons, the supply issue hasn’t been lost on him. Finance officials tried to persuade the British Columbia and Ontario governments to take steps to increase home supply as part of a more comprehensive effort, but have so far received little interest. New housing supply is particularly acute in Toronto, where the number of low-rise homes built in the city fell 22 percent in 2015 from a year earlier to 12,156 units. That’s the lowest since 1995. Completions of new single-detached homes fell 18 percent to 7,871 units in 2015, the lowest since 1978. New home completions in Vancouver have been doing better -- within the average of the past 15 years -- but even here remain below long-term historical levels. Including the demolition of older homes however, the Canadian Homebuilders’ Association estimates the stock of low-rises in Vancouver is actually down 20 percent from 10 years ago. Federal officials have been tinkering with the availability of government insurance for at least 50 years, but nothing to the extent of the past decade. Dodge was forced to respond 10 years ago to then-Finance Minister Jim Flaherty’s decision to allow the country’s mortgage insurers to cover no-money-down, 40-year amortized mortgages. Since then, federal officials -- from Dodge to his successors Mark Carney and Stephen Poloz and now Prime Minister Justin Trudeau -- have agonized over the issue. Flaherty, who said privately he was embarrassed by the initial loosening step, would later reverse course and rally the tightening charge. The net result has been a Canadian government that has become hardwired to worry about the problem -- the heads of all the main regulators after all are veterans of a financial crisis that was rooted in a U.S. housing bubble. The question is whether the pendulum has swung too far, especially as Morneau considers forcing lenders to share in losses associated with defaulted mortgages -- a part of the system considered hallowed ground for the industry. After all, the 100 percent guarantee is designed to ensure banks continue to lend even when house prices plummet, something Dodge says will happen at some point. “It is conceivable there could be further tightening rules but I think the issue is going to come when all of a sudden one of these markets go sour and there is a desire on the part of government to encourage home ownership again,” Dodge said.